In the middle of 2014 at a Get Berkshire Active (GBA) meeting MSC first heard about Sport England’s Satellite Club program. It was decided that for 2015 MSC would try this program out. With the help of GBA and Patrick Knock from BSUK, a plan to deliver a Satellite Club was developed. The biggest challenge was finding a venue that meet the GBA criteria and somewhere MSC could deliver sessions at. We were really fortunate that Newlands Girls School stepped in to support the program. With the funding in place and the venue lined up, it was now a question of picking a launch date and advertising the program. February 4th was picked as the first session and using MSC’s close relationship with the Schools Sports Lead for the Maidenhead area we sent out posters and information to all the local school. The first day of the club was a nervous time, did the word get out? Would anyone come? Who would come? The first night saw 3 girls from Newlands turn up and try Softball out. Of those first three, two would eventually go on to play for the Rebels in the league, but it was a start. One month and the group had grown from 3 to 7. March was a very good month with attendance rising from 7 to 12 boosted by a large number of pupils from Altwood schooling coming to try the sport. The whole aim for MSC in 2015 was to give as many people a chance to try Softball as possible, if any of those moved on to become members it would be a bonus. Easter Holidays meant attendance in April dropped a little, but as we went outside, May saw the average attendance reach 9 for a month for the first time. The numbers would fluctuate through the summer and into the autumn, but weekly consistent attendances was not one of the key metrics MSC was measuring, what makes this the most successful recruitment program MSC has run is that fact that to date 57 different people, 19 adults and the rest under 18 have tried Softball, 11 have gone on to play for the Club in either League, Tournaments or both and in recent weeks, the beginnings of an under-14 team have started to emerge. The year has taught us a number of lessons about club promotion. 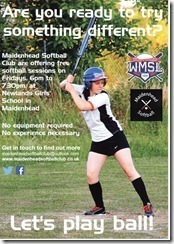 Using the local authorities, social media, our website and putting up posters on community notice boards around Maidenhead we have had a steady stream of enquires about Softball all year. Not all pan out, but we are very happy with the 57 who have come along. As the Club closes in on its first birthday, the aim for 2016 is to reach the 100 mark of people trying the club and converting at least 15 attendees into full MSC members. Co-Ed Slow-pitch softball is a social and enjoyable game that’s easy to learn and play, even for people who are not “athletes” or don’t have much experience of team sports. Come and Try it for Free. This entry was posted in Club News, Indoor Training, Satellite Club, Season Review, Youth and tagged Maidenhead Softball Club., Satellite Club, Taster, Try Softball, Youth on December 4, 2015 by maidenheadsoftballclub.